BETHLEHEM (Ma’an) — In October 2015 began what has been in turn called a wave of unrest, a Palestinian upheaval, or even the “Jerusalem Intifada.” Whatever the name, the past year has seen an intensification of deadly violence in the occupied Palestinian territory and Israel. The first six months — from October 2015 to March 2016 — saw the vast majority of deaths, following clashes at the Al-Aqsa Mosque in occupied East Jerusalem ahead of the Jewish holiday of Rosh Hashanah. With 234 people dying in these first six months, the rate of casualties has since drastically slowed down, although a spate of killings in September have led to fears that violence could once again surge. Minors comprised a quarter of the victims of Israeli violence, with 59 slain Palestinians under the age of 18, the youngest being an eight-month old baby killed by excessive tear gas inhalation during clashes. 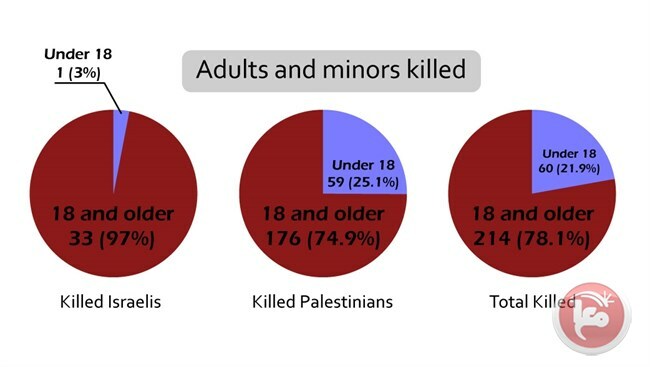 In total, 11 Palestinian children under the age of 14 were killed, and another 48 between the ages of 15 and 17. Another 119 Palestinians between the ages of 18 and 24 were killed, making a total of 178 Palestinian casualties in the past year to have been born around or after the signature of the 1993 Oslo Accords. Based off of these numbers, 122 Palestinians, or 52 percent of them, were killed while committing or allegedly committing stabbing attacks, confirming the perception of the past year being marked by small-scale attacks with knives or similar weapons. – and 2 Israelis were killed by friendly fire.